With some of the world’s most talented designers and illustrators being members of the hot rodding family, Goodguys has decided to get the industry’s finest artists, Goodguys members and event participants involved in the 2012 Grand Prize Giveaway Car! The challenge? 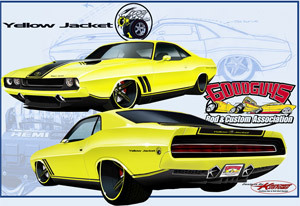 Submit a colored rendering and theme of the 2012 giveaway car; a 70′ – 72′ Dodge Challenger! Kaucher Kustoms has submitted our design, and need your help and your vote! If you like my car better then the others, please visit 2012 Good Guys Give Away Car voting website and the take a minute and vote for it. The Yellow Jacket is based of a concept car that Dodge built in 1970 the car was introduced as a potential Corvette fighter. 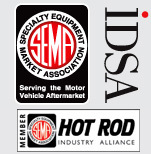 I saw the original car in 1970 when I attended the Greater Los Angeles Car Show with my dad in 1970, it was the coolest car I saw there, and I never forgot it. When I started on my concept for Good Guys I used it as my starting point. The deep recessed tail light panel was the only design element, that I chose to use from the original car but I loved the name so I used it for my Good Guys Challenger entry. My concept as the rear C pillar cut and leaned forward and stretched further back towards the edge of the trunk giving the car a less formal looking roofline. I then designed custom body colored side mirrors, added a custom restyled forward tilting hood like a Corvette, under the hood resides a late model super charged 426 Hemi backed by 6 speed trans. The front fenders have black anodized billet side vents and the fenders and hood have been extended 3 inches. The stock ’70 grille housing has been reworked to house late model Challenger headlights the hood has been dropped down over the lights with a deeper drop to the center creating a snarled look to the front of the car. The front lower valance houses Chrysler Penstar shaped driving light housings with a chin spoiler that forces air into a lower grille that cover the intercooler for the super charger. The rear of the car I recessed the reworked factory tail light housing deeper into the trunk area. The tail light housing also houses a gas door that covers the now centered fuel filler, below the the Chrysler Penstars repeat again only this time as exhaust tips with an integrated diffuser panel below them. The wheels black satin finished five spoke two piece 20 “ diameter wheels accented with matching pearl yellow paint used on the cars body. The fronts are 11” wide and the rears measure 15”. Black accent striping across the hood and trunk and the lower rocker panels adorn the car along with Yellow Jacket decal badging, giving the car a factory concept feel. Again, we’re very proud of our design, and appreciate you taking the time to vote for it. This entry was posted on Wednesday, January 5th, 2011 at 11:32 am and is filed under Blog . You can follow any responses to this entry through the RSS 2.0 feed. You can leave a response, or trackback from your own site. Magnificent website. Lots of helpful information here. I am sending it to several buddies ans additionally sharing in delicious. And certainly, thank you for your effort!